Cedar Meadow Farm is a world class facility with top of the line ammenities. The stalls are all 12x12 box stalls with rubber mats and bedded with shavings. 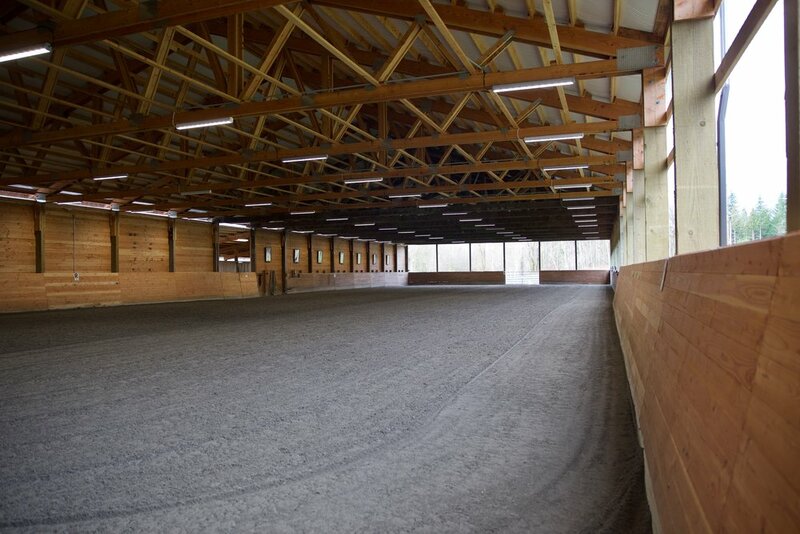 Each stall has an attached large paddock with mud-free footing. The stalls are cleaned daily. Some stalls have Nelson heated automatic waterers, while other stalls have water provided in buckets. Water intake can be monitored for each horse, and the water is changed and cleaned regularly. There is daily turnout for all of the horses. Premium quality Eastern Washington hay is fed three times daily. Grain and supplements are fed at no extra charge. Blanketing is also included in board. The facility boasts an Olympic sized covered arena with mirrors and lights, as well as an Olympic sized outdoor arena. The exceptional footing is provided by Mark Rowley of Efficient Arena. There is 24 hour supervision of the farm, and the people responsible for the horses' care live on site. Cedar Meadow Farm is a top quality boarding stable where each horse receives excellent care and attention, from valued family pets to international level show horses. call (360) 453-7196, or email cedarmeadowfarm@gmail.com.